The Winghams: What a clan! The family of the Rev. Allen and Elizabeth Richmond Wingham, on their 50th anniversary. 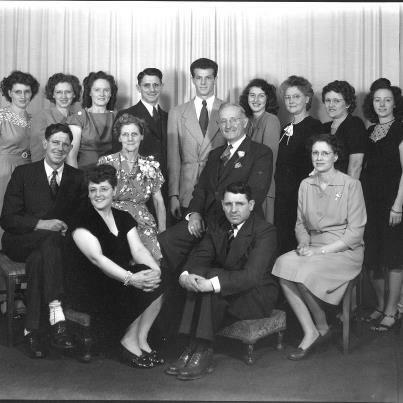 Front row, from left: Omer Wingham, Irene Wingham Meyer, Roy Wingham, Rubye Wingham Engle; center, Elizabeth and Allen Wingham; back row, Mabel Wingham Phillips, Christine Wingham Darnell, Martha Wingham Renschler, Ray Wingham, Joe Wingham, Judy Wingham Hylcord, Naoma Wingham Watson, Ruth Wingham Leach, and Kathleen Wingham Kinnaman. Uncle Joe was a private man, not given to easily mixing with many people, including most of his family who lived in Indiana and Kentucky. But he was a good husband to my Aunt Joyce, a loving father to their three sons, and a proud grandfather who had seen one of his grandsons graduate from college and move straight into a good job, this past year. Joe Wingham grew up mostly in the Kent area, and after the U.S. entered World War II due to the Pearl Harbor attack, he joined the U.S. Navy as a teenager, eventually becoming a gunner’s mate on a fighting ship. Some time after his discharge at the end of the war, Uncle Joe re-located to the Cincinnati area, where he was employed by the state of Ohio for many years. He and Aunt Joyce also were involved in commercial business ownership, including Joy Travel, which Joyce and their son Greg still operate. Uncle Joe after his retirement preferred mainly staying at home, spending many hours tending his garden, which was his pride and joy (next to his family, of course), and his yard. Like his older brothers and sisters, and his younger sister, my aunt Judy Wingham Hylcord who died two years ago, he was born to a couple who combined farming and the Methodist ministry, my grandparents, Allen and Elizabeth Richmond Wingham. They were both natives of Trimble County, KY, where they were married very young in 1897, and where they lived, farming, and having a new baby roughly every two years, until about 1918, when they moved with their large brood across the river to Madison. Allen felt drawn to the Methodist ministry, and after taking a correspondence course which the church offered in those simpler times, he was ordained, following an examination by a board of senior ministers. From then until his retirement from the ministry in 1931, Allen Wingham and his clan moved often, as the Methodists then and now believe in shifting their pastors around often, so that the grass doesn’t grow under their feet. Besides Kent and several other communities, they spent several years in Napoleon in Ripley County, where my mom, Rubye Wingham, married my dad, Tony Engle, the son of an area farmer; my Uncle Omer, Mom and Joe’s oldest brother, was wed to a tall young woman named Anna Rohlfing; and my Aunt Irene married a young auto mechanic, Leonard Meyer. The circumstance of Grandpa being assigned to pastor the Napoleon Methodist Church forged permanent ties among the Winghams, Rohlfings, Engles, and Meyers. Of course, as the Wingham brood grew up, married and moved away from home, they scattered, as is the custom among Americans. But they didn’t scatter too far — Indianapolis was the farthest point from Madison, where Grandpa and Grandma lived in their later years. Uncle Omer, Aunt Christine Darnell and Aunt Kathleen Kinnaman all settled in the state capital, Aunt Martha Renschler in Scottsburg, Aunt Irene (or “Aunt Reen,” as she preferred to be called by her multitude of nephews and nieces) stayed in Napoleon with Uncle Leonard and their children; and of course, Uncle Joe migrated to Cincinnati. Aunt Judy and native Madisonian George Hylcord wed when she was 18 and he 23, and they lived here or in Hanover for all their married lives. Kathleen, or “Aunt Kat,” as we cousins all called her, was the only true redhead in the family. Uncle Roy Wingham, who lost all his left hand but the thumb in a factory accident at age 19, was a bachelor who lived with Grandpa and Grandma until both were deceased. Although he was what people nowadays would call “disabled”, he always had a job, drove his own car or truck, and there wasn’t much he couldn’t do for himself . Late in life, after Grandma’s death, he finally got married, at age 77, to my Aunt Dorothy, who was the same age and twice a widow — which shocked, but delighted, the entire family. His marriage lasted, happily, until his death at age 92. Uncle Ray Wingham married Erma Kyle of Hanover, and they lived in that town and, later, Madison, until both had retired, and moved to Florida. Like Uncle Joe, Ray served in the U.S. Navy in World War II. Ray was a businessman in Hanover and Madison. Late in his life Ray began writing an autobiography which preserved much vital information about the family’s early history. Sadly, Ray passed away before he could finish the book. Aunt Mabel Wingham married Walter Phillips of the Deputy area, and they lived on their farm there for their entire marriage. Aunt Ruth Wingham, the oldest, was wed to a young Trimble County farmer named Shirley Leach, and they lived in the Bluegrass for their entire marriage, raising their own large family. A number of their descendants still reside in Trimble and Jefferson counties. Aunt Naoma Wingham Watson, the most formally religious of the 13, lived for most of her life in Trimble and Jefferson counties. Aunt Christine Wingham was originally married to a young man named James Young, who had moved to Jefferson County from Kansas during the Great Depression to participate in a federal works project. They were wed in 1938, but on D-Day, June 6, 1944, Uncle Jim was killed when the Army Air Force plane he was in as a paratrooper was shot down over France during the Normandy Invasion. Chris later re-married to an Indianapolis bus driver, Roy Darnell, our “other Uncle Roy,” who was the only husband of Aunt Chris’s that we younger nieces and nephews ever knew. All of us Wingam-descended cousins have memories of our kinfolks of the previous generation. Uncle Omer was a tall, lanky man with an infectious grin and the gift of gab, who sang, played guitar, fiddle and mandolin, and as another of my cousins said, “lit up a room.” His nickname was “Happy” — although mostly among his friends, not his family. Aunt Martha was a laughing, witty woman who was a joy to be around; “our favorite aunt,” many of us would say (while remaining anonymous so as not to hurt anyone else’s feelings). The Wingham musical talent didn’t begin and end with Omer. My mom, Rubye; Aunt Mabel, and Aunt Judy would often sing as a trio at church or family events. Mabel and Judy were fine piano players, too. Ray, also a gifted singer, was a member of the choir at Trinity United Methodist Church for some years. The Wingham women especially tended to run the gamut from talkative and assertive, to reserved and (relatively) quiet. But my observation was that, when riled, all could “carve a ham off ya” with their tongues. I saw Mom carve a couple of them off one of her sisters (who shall remain anonymous) one time in a dispute over a family matter. Grandpa and Uncle Roy, in the senior Wingham’s last years, owned and operated a used furniture store on Jefferson Street, on the west side, just north of Second Street. One day in March 1957 Grandpa helped a customer to lift and move some heavy furniture he had just purchased. The next afternoon, walking home to Walnut Street, Grandpa had a massive heart attack and died, at age 78. Had he lived another 20 days, he and Grandma would have celebrated their 60th anniversary. Many years later, I was reading a book by the Hollywood director Martin Scorsese, about some notable American-made movies. The frontispiece, the picture facing the title page, showed Frank Sinatra and Shirley MacLaine in the climactic scene of “Some Came Running,” filmed at Madison in 1958. Sinatra has just been shot by a jealous suitor of MacLaine’s, and has fallen to the ground. MacLaine is looking just off-camera, toward the gunman, and screaming in terror. And if you look at the top of the picture, above Sinatra and MacLaine, you’ll see that there’s a sign on the storefront they’re in front of. It says, “Wingham & Son, Used Furniture.” Grandpa and Uncle Roy’s store — no longer in business by that time, but immortalized in a publicity shot from a first-run Hollywood movie. My Uncle Omer passed away in 1967. Grandma died in 1972, at age 90. The other brothers and sisters went to their rewards, one by one, as the years passed. Uncle Joe was the last. It was, so to speak, the end of an era. But the Winghams — WE Wingham descendants– live on. Allen and Elizabeth weren’t the only Winghams to “be fruitful and multiply,” as the Bible says. Allen had only one brother, Ira. Ira and his wife, Abby Smith Wingham, raised 10 children on a Trimble County farm. Allen and Ira had a first cousin, Henry Wingham, who married a woman named Effie Green, and they were the parents of 14 children — although they lost four of them in infancy. Another first cousin, Giltner Wingham, who was a generation younger (he and Omer Wingham were the same age), and his bride, Marie Ferguson of the Dupont area, had 10 children born, although two died in infancy or as toddlers. So from four Wingham families, 48 children were born, with 41 reaching adulthood. Needless to say, the numbers of grandchildren, great-grandchildren, etc., are like the stars in the sky. At one time, the families of Allen, Ira and Henry lived on three adjoining farms in Trimble County, near the headwaters of Canip Creek. What a clan that must have been! One day in 1839, aged either 19 or 20, James kept that pledge, boarding an immigrant ship for America, possibly in Liverpool, and quite likely accompanied by his brother. When the ship arrived in the United States it docked in Galveston, Texas. Records show a “James Wingham” disembarking from an immigrant ship there in that year. This is where the story gets murky. Mom always told me that James and several other young men (she never mentioned his brother), set off on foot to try to walk to the Mississippi River, in hopes of catching a steamboat and working their way north on it. They were in an area which had suffered extreme drought; the water they carried soon ran out, and eventually they were all severely dehydrated. Suddenly they came to a place where a freak thunderstorm had broken the drought. The downpour had left the bare ground very muddy, and drovers had then happened to move a herd of cattle through, leaving their hoofprints deep in the mud. Water had collected in the hoofprints. Mom always said that the other young men, with the foolish recklessness of youth, threw themselves on the hoofprints and began gulping the water as fast as they could swallow. James, apparently more mature or just smarter, drank sparingly from the hoofprints, then crawled away and rested for a while. Then he crawled back again, drank a little more, and crawled away again. Eventually, his strength began to return. His companions went into severe convulsions from too-rapid rehydration, dying right there on the ground. We don’t know if James tried to bury them, or say any words over their corpses, but he eventually went on his way, and finally reached the Mississippi. Then James Wingham vanishes from our view for about five years. Obviously he somehow made it to Trimble County, KY, because in 1844, he is listed in county records as owning a small piece of land there. Then on March 11, 1845, his 25th (or 26th) birthday, he married a young Kentucky girl, Frances Monroe, who had roots in Virginia. More family lore alleges that an uncle of hers was President James Monroe, but I haven’t been able to establish whether that is true or not. The new couple, settled on their small farm, quickly got busy at what the clan he established seems especially good at — having children. By the time the Civil War was a year old, they had five children living; their oldest son had died at one year old. They would have two more children, in 1866 and 1868. In the fall of 1864, the North was starting to run short of manpower for the Union Army, and President Lincoln put out a call for more volunteers, with a $100 bounty offered to any man who enlisted. Apparently James and Frances decided they could well use that $100. So James enlisted in the army, as did many thousands of others. But then, in the early spring of 1865, when it was obvious that the war was almost over, and thousands of Union soldiers who were farmers knew that the spring plowing and planting time, essential to farm families, was hard upon them, many of them simply deserted. One was James Wingham, who returned to Trimble County and his farm. It isn’t clear whether he was ever actually disciplined for his desertion, but it remained on his record when he was officially mustered out in the fall of 1865, after a year — officially — of service to the Union. James Wingham lived to be 79 — or possibly 80 — dying in December 1899 in Trimble County where he and his family had lived for nearly 60 years. Frances tried to draw a widow’s pension based upon his service during the war, but initially was turned down because of James’ deserter status. However, she must have appealed the government’s decision, because in 1902 her pension was finally granted. Frances lived until 1906 — or possibly 1916. Again, the records on the issue are murky. Several of James and Frances’ children had large families of their own. One had 11 children born; another, 10; and a third, nine. Several of those children did not survive to maturity, as was often the case in those days, hower. And then came my grandfather’s generation, when the sky seemed to be RAINING Winghams! It’s possible that James’ brother DID die. But here’s an interesting fact: In the state of Texas (remember that immigrant ship landed in Galveston), there are a sizeable number of Winghams living, to this very day. Where did their ancestors come from? I haven’t been able to trace that yet, although I plan to tackle it soon on ancestry.com . There’s an intriguing possibility, though: What if James’ brother DIDN’T die, but merely decided to seek his American fortune in Texas, instead of traveling north with his older brother? What if he married, and fathered a large family, as James did? What if his descendants also were fruitful multipliers? It could explain the Texas Winghams as being related to those of us in the Midwest. If any Winghams from Texas read this, and have information about their family histories, I hope they’ll feel free to post comments on this website. Cousins or not, I’d like to talk to you! Here’s one final anecdote about the Winghams of the 19th Century, told me by Mom (the source of a number of these stories). She said that a man named Rose, probably an uncle of Grandpa’s mother, Martha Ellen Rose Wingham, went west to California after the Gold Rush of 1849 commenced. Despite some ardent prospecting, he didn’t find very much gold. But what he did find, he took to a watchmaker, who used it to make Mr. Rose a pocket watch with the case being solid gold — no alloys. Gold being a very soft metal, the case of the watch wore thin just from being carried in Rose’s pocket. Seems to me like a shameful waste of a precious metal! I’d have put it up on the mantel. ← America, you blew it, big-time! My name is Karen Spears and I am the daughter of Rick Meyer, grandaughter of Irene Wingham Meyer, and great-grandaughter of Allen and Elizabeth Wingham. I thoroughly enjoyed the Wingham story and could barely read it due to the tears filling my eyes. Great Grandpa Wingham had passed before I was born but I remember trips to Madison to visit Great Grandma Wingham and Uncle Roy. I remember taking Grandma Meyer (Irene)on trips across the river to Kentucky to see her old Kentucky home and Canip, and how much she loved it. I miss her so as I read your story. I remember the beautiful picture of the Wingham family in your article and thank you so very much for writing this wonderful story on the family, I will treasure it and pass it on to my son. Thank you so much, Karen, for your kind words. I’m so glad that you enjoyed the story. As I wrote it, I recalled many anecdotes and old family stories that I’ve heard from Mom, older cousins, and others, only a few of which I could work into the story. Again, I’m so glad that you enjoyed it, Cousin! A well written story, Old Corporal. Enjoyable and informative! Obviously you did a lot of reaearch for this, and it shows! I am sure, more people than the Wingham clan, are happy you went to all that work! Thank you, good friend. You are very kind. And I do hope some of those Texas Winghams see it, and get in touch with me on here. Thank you so much for the article! I am the oldest daughter of Rick and Janet (Witkempter) Meyer, Irene’s family. I have shared this with my 4 children and 4 grandchildren! Another thought came to mind…Grandma Irene used to write an article that was published in the Greensburg Daily News on the happenings in Napleon, Indiana! Glad to see the writing runs in the family! Nice to read something that does not blame minorities for societies problems. Are you on my website again, troublemaker? Go peddle your politically correct crap somewhere else.